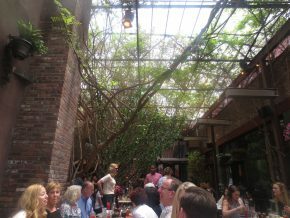 The Park in Chelsea is quite literally a beautiful place to eat. It isn’t an actual park, but the marginally glassed-in courtyard area is so full of growing green things that a bird took an actual crap on my mother-in-law before we had the opportunity to order our food. No joke. But this was brunch, so we laughed it off, took down some Bloody Mary’ses and pressed on. Pickles and lettuce? More like insult and injury. We all know I’m a sucker for an egg on a burger. So when we headed to Cookshop in Chelsea for a very special birthday brunch, I had but one option for my meal. It was called the Finger Lakes Grass Fed Beef Burger. While the place didn’t get any points for creative naming, the ingredients sure looked good. At some point, the world decided that the best bagels in the world are in New York. As with the pizza, the claim is that it has something to do with the water. I, however, think this does not do justice to the quality of cooking that goes into the production of these things. Obviously not all bagels and pizza in New York are good, so there is much more going on than meets the eye. 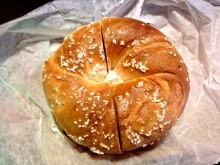 In my own search for a tasty bagel, I was sent to Murray’s Bagels in Chelsea. It’s like a stationary food truck. New York’s Chelsea Market is definitely a fun place to grab some lunch. It’s like LA’s Grand Central Market, but far fancier. And like any similar market, each food stall has a specialty. Like any good human that has spent a significant amount of time in Southern California, I need good tacos every once in a while and Pittsburgh has not yet delivered. So when I saw Los Tacos No. 1 in the Chelsea Market, I knew I had to make their tacos mine.